Houseboat Flag - any custom printed flags for house boats? We want to buy a houseboat flag, and we're looking for high quality or custom printed flags to use on house boats? We have seen the ones from Walmart, and they don't seem to last more than one season with the sun and wind. We have seen other people that had some really good, top quality flags, and they had them for years. We'd like to find one that we don't have to change often. 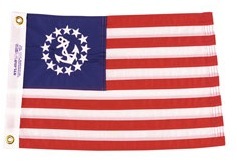 Is there any flag shops, or stores that you can recommend? Thanks for a great site, Barbara from Kentucky. Well Barbara, I agree with your logic about buying a quality flag, and you definitely do get your money's worth. Cheap low quality flags just don't last long, especially considering the wind, sun, and the marine elements. You can go here for long lasting, high quality houseboat flags. And you'll find a wide selection of flags and custom printed ones here. Lastly, hopefully some of our readers will share and post comments about their houseboat flag experiences and tips. Feel free to use the "Click here to post comments." link found near the bottom of this page. Comments for Houseboat Flag - any custom printed flags for house boats? Hello, my brother-in law can make custom flags. He made one with the name of our boat to match our other decals! Contact Dan Sheshull at Fayette Graphics in Winchester KY. I tried to post a photo but the format will not allow it. Barbara, while Wal-Mart sells American made American flags, most of the rest are from China and of poor quality and will not last any time at all. I suggest you go on line and just type in "American Made Flags". Onlinestores.com is one. I'm sure you will find what you are looking for. The prices for most flags are comparable to the Chinese made, but the quality is far superior.